training packages that have been approved for implementation. Contributions to the development of the website can be made via the survey (on the homepage) or the feedback form. Bronze Medallist - Matthew Cleave, Sydney West Region, TAFE NSW South Western Sydney Institute. The Competition was held from 17–19 May at the Melbourne Convention & Exhibition Centre in conjunction with the Air Conditioning Refrigeration and Building Services (ARBS) Exhibition. With fellow industry professionals looking on, it was game on for the nation’s top 10 refrigeration apprentices, with just 18 hours to demonstrate that they have the best skills and knowledge of refrigeration and air conditioning in the country. Read about their incredible journey. In addition to the spectacle of competition, WorldSkills Australia will be hosting an exclusive careers expo at the 2016 WorldSkills Australia National Competition in Melbourne. The Skills Village is a ‘one-stop career shop’, a valuable opportunity for training providers and industry-leading organisations to directly connect with young people and discuss the career pathways available to them. In addition to exhibitor stalls, organisations will also have the opportunity to host fun, interactive skills demonstrations as part of WorldSkills Australia’s popular Try’aSkill program. Try’aSkill demonstrations encourage visitors to test their hand at a range of basic tasks using different types of techniques and tools required in a wide variety of trade and skill-based professions. Join exhibitors such as Bendigo TAFE, Box Hill Institute, Kangan Institute, Gordon Institute, RMIT University and VACC. Booths are limited. Express your interest now or visit the WorldSkills Australia website for more info. 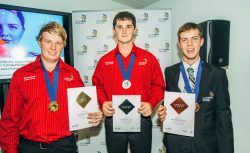 For those who have competed in a National Competition, we would like to invite you to be a part of an exciting new network, WorldSkills Australia Alumni. Staying in touch with previous team mates. Register expression of interest to become part of the Alumni network. SkillsOne is taking careers advice out of the office and onto the stage through exhilarating shows packed with music, film and theatre! The Skills and Thrills showcase brings five engaging shows to the local clubs of Penrith, Wentworthville, Blacktown, Campbelltown and Cammeray throughout the months of June and July. Rapid technological advances are changing the world of work, and young Australians need to keep informed. Finding the right career can be a daunting prospect. The showcases outline the latest in industry needs, career trends, and how to connect passions to a career outcome. 4 July - Penrith Panthers Club, EVAN Theatre, 7.00–8.30 pm. For any enquiries please contact info@skillsone.com.au or visit the National Skills Week website. VETnetwork Australia’s new website is up and running! The website is now easier to navigate, provides valuable content and resources, and provides a professional hub for Members and the wider VET community. Representing VET professionals in Australia for over 20 Years, VETnetwork Australia is a national network of teachers, trainers, career advisors, program coordinators, administrative and support personnel committed to vocational learning and youth transition. Visit the new website. Nearly 40% of Australian employers offer jobs which require a vocational qualification. This means that ongoing access to training achievements could be important for that next job. With the introduction of the USI in 2015, individuals will be able to access a copy of their training history from the national VET data collection in years to come. Student USI accounts will be updated at least once per year to include any study they have completed in the previous year. It is important to note that training providers will still be the primary source for student training records, particularly for recently completed training but the online record accessed through their USI will be a valuable backup as the years go by and as training providers change and older records become harder to find. Data submitted by training providers to the national VET data collection will be used to generate USI transcripts therefore it is important that they ensure their data submission is correct. This year, for the first time, Australia's major survey of students for rating the nation's vocational education and training (VET) system has expanded to include students who pay their own way with private training providers. Over the coming weeks around 220 000 students will be asked about their recent training experience. Managed by the National Centre for Vocational Education Research (NCVER), the annual national Student Outcomes Survey involves students who completed their training with a VET provider in 2015 and provides information on employment outcomes, training satisfaction, and the benefits and relevance of training. Results from this survey will be available on NCVER's Portal in late 2016. Visit the NCVER website for further information about the survey. Updates have also been made to Using other parties to collect evidence. Accredited course owners can now access the slides from ASQA’s recent Course Accreditation Briefing Sessions. These are also available on ASQA’s Slideshare channel. Skills Impact has been working with Industry Reference Committees (IRCs) on the release of training packages in the new standards, as well as the Australian Industry and Skills Committee (AISC) review of IRCs. Following endorsement by the AISC, some training packages are now available for implementation on training.gov.au while other packages are undergoing a review process to ensure industry is satisfied that the converted units fulfil the requirements of the job role. Read more. The AISC has also recently outlined key guiding principles to assist in the review of IRCs. Three of the IRCs that Skills Impact have responsibility for supporting are currently participating in the pilot review. Learn more about the IRC Review. Australian Apprenticeships Ambassadors know first-hand the value of investing in an Australian Apprenticeship. For many, it has been the passport to a better job, a higher pay packet and a more rewarding working life. Importantly, it has given them the skills they need for a secure future. Meet three new Ambassadors. 21 year old Adele Di Bella began her Certificate III in Retail Baking (Combined) not realising that it would lead to her meeting and being mentored by world-renowned pastry chef Adriano Zumbo. She decided she wanted to undertake an Australian Apprenticeship because she didn’t see herself completing Years 11 and 12. Having always had a passion for making cakes, Adele listened to her instincts, finished school early and enrolled in TAFE. Her enthusiasm and drive to succeed came to fruition when she was selected as a 2015 WorldSkills Australia Skillaroo. Adele represented Australia in Sao Paulo, Brazil and brought home a Medallion of Excellence for her work. During the competition preparation her mentor was none other than Adrian Zumbo. Read more. 18 year-old Daniel O’Brien has had an interest in the healthcare system since spending time in hospital with a fracture in Year 7. He changed that fascination into hands-on work by commencing an Australian School-based Apprenticeship (ASbA) in Year 10 and completing his Certificate III in Health Services Assistance in July 2015. Daniel enjoys the diversity of his role as a trainee at the Caboolture Hospital and has had such a positive experience with his traineeship that he recommends Australian Apprenticeships not only as a great experience but as a viable career pathway. His dedication to his work and learning earned Daniel the 2015 Queensland School-based Apprentice of the Year, a place as finalist at the Australian Training Awards and his appointment as an Australian Apprenticeships Ambassador. Read more. For 16 years, Sharan Berry has been at the leading edge of hairdressing training as a vocational education and training teacher/trainer in TAFE Queensland East Coast’s Creative Industries department. Starting her career as an Australian Apprentice, she has since been a manager, a trainer and a part-owner of a highly successful hair and beauty salon. Sharan collaborates with industry to deliver customised courses and offers flexible assessments in the workplace or on campus in line with industry expectations and standards. Passionate about the future of the hairdressing industry, Sharan has been an active contributor to the improvement of the national training package for hairdressing. She was named Runner-up VET Teacher/ Trainer of the Year at the 2015 Australian Training Awards. Read more. Registration is open for the 25th National Vocational Education and Training Research Conference No Frills. The National Centre for Vocational Education Research (NCVER) is co-hosting this year’s conference with CQUniversity. Register online now to secure your place. The early-bird rate is available until 25 June for the ACPET National Conference and Asia Pacific International Education Forum. This year's theme is Connecting Knowledge skills and Futures through Innovation. Register now. 1 July 2016 - Registrations to attend the 2016 Australian Training Awards presentation dinner event will open. Register your interest by emailing australiantrainingawards@education.gov.au. Velg Training provides a range of Vocational Education and Training (VET) professional development and consulting services. Information about Mentoring Mondays, Live Streams, Webinars and Workshops is available on their website. The TAE Training package has now been endorsed by the Australian Industry and Skills Committee. Read about the workshops for RTOs being held in the capital cities during June and July. ACPET, a national provider of professional development training, is recognised for promoting excellence in education by providing high-quality PD programs. View the upcoming webinars and workshops on the ACPET website. Should you require assistance to register or to purchase a recording, please call (03) 9412 5900 or contact the PD team at pd@acpet.edu.au. View the TAE40116 Certificate IV in Training and Assessment learner guide sample pages on the Shea Business Consulting website or the Software Publications website. For more information, please email Shea Business Consulting. • Capturing learning with Tin Can (xAPI). If you would like to provide feedback, supply an article for inclusion in the next edition or join our list of subscribers, please email skillsatwork@education.gov.au. The next edition will be published in July 2016. Submissions are due by Friday 17 June 2016.